Ryan Miller has been on a bit of a roller coaster over the last few seasons. Coming into the year, he looked to be on the Team USA bubble despite the fact he was the MVP of the 2010 Olympics. The veteran netminder has enjoyed a bit of a renaissance this season despite having one of the league’s worst teams in front of him. Now Miller almost looks like the front-runner to start for Team USA. He’ll still have some competition in Jonathan Quick, but Miller looks to be leading the way at this point with only weeks remaining before the NHL takes its Olympic break. Miller has enjoyed a long and successful career with the Sabres, but his performance at the 2010 Olympics in Vancouver will be as much a part of his legacy as anything else. That 2009-10 season was the best of Miller’s career and ended with him winning the Vezina Trophy. Though the Sabres have been poor, Miller’s .927 save percentage at this point of the season is the closest to the .929 he finished his Vezina campaign with. And, surprisingly enough, his even-strength save percentage this year (.930) is better than the .928 mark he put up at even strength in 2009-10. Quick has looked mostly good since his return from injury, but Miller has been at his best all season long. It’s going to be an interesting decision for Dan Bylsma. What he brings to Team USA in 2014: Expecting Miller to repeat his 2010 performance would be asking a lot. However, he’s Team USA’s oldest player and has excelled on this stage before. That’s going to be valuable for both Miller and the team’s confidence. Where Miller lacks a little bit, and this is true of Quick as well, is the relative lack of repetitions on bigger ice surfaces. Miller played college hockey, where some teams use bigger ice surfaces, but Michigan State had an NHL-sized rink. Miller’s last turn at the World Championships was 2003 in Turku, Finland and it didn’t go well for him or Team USA. The U.S. actually had to play their way out of relegation and Miller finished with a paltry .889 save percentage (though the team in front of him was rather uninspiring). The Sabres netminder is obviously more experienced, but the adjustment to the big ice is not to be undersold for goaltenders. It is an adjustment and Miller had mentioned he wanted to try to get some practice time on an Olympic sheet before. Obviously that’s easier said than done during the NHL season (so probably not going to happen). It’s still about seeing and stopping the puck and Miller has done that very well, so he shouldn’t be too surprised out there. With the way he’s playing now, it’s hard to go against him as Team USA’s starter at this point. He’s playing so well and hasn’t let his game drop while in a bad situation. Miller’s also a UFA at the end of this season, so padding his resume with another solid showing at the Olympics probably won’t hurt too much. He is going to be an important part of this team one way or the other. His presence on the ice and in the dressing room will be good for a relatively young team. 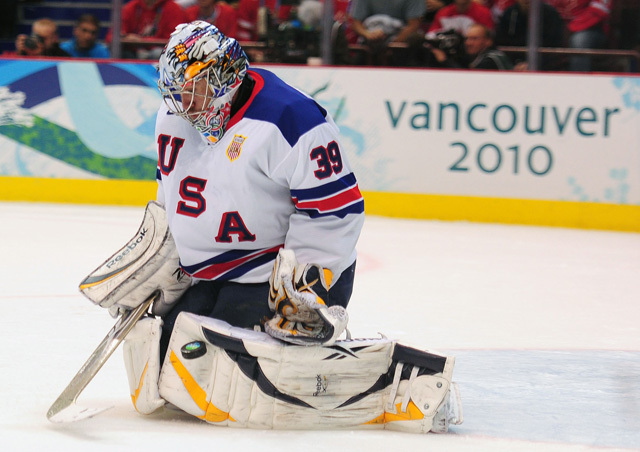 Memorable USA Moment: Ryan Miller’s performance in 2010 was nothing short of remarkable. In fact, statistically, it was the greatest performance ever by an American goaltender at an Olympic Winter Games as Miller’s .946 save percentage is a single-tournament record for an American goalie in the modern era. He was named the best goaltender and Olympics MVP. Though the end result was different, Miller’s 2010 run belongs in the conversation with Jack McCartan’s incredible performance in 1960 and Jim Craig’s backstopping the Miracle on Ice in 1980. McCartan had a .917 save percentage in the 1960 Olympics to backstop the U.S. to gold and Craig put up a .924 mark in backing the Miracle on Ice squad. If you adjusted those totals to today’s game, they’re probably on a par with Miller’s big save percentage. Miller’s performance, at the very least, was clearly the best by any goalie at the Olympics since 1992. America may have forgotten that Ray LeBlanc put on an absolute show in Albertville, France. He had a .943 save percentage in eight games during Team USA’s surprise run which ultimately ended in fourth place. Team USA fell to eventual gold-medalist the Unified Team, made up of players from the former Soviet Union. Going back to 2010, Miller was the main reason the U.S. even had a chance in that tournament. He made 36 saves in the gold-medal game, keeping the U.S. a goal away from being Olympic champions. He undoubtedly gave that U.S. team a chance in every single game and at times, stole them, like he did against Canada in the preliminary-round with a 42-save performance. Miller also shut out Switzerland in the quarterfinals and stopped all 18 shots he faced against Finland in the semis before being pulled to rest up for the gold medal game. It’s certainly no exaggeration to say it was one of the best single-tournament performances in Olympic history. He got louder cheers than Sidney Crosby did in his own building. It’s one of those great moments that shows how much excitement the Olympics brings. Miller’s performance in 2010 puts him in a remarkable class of goaltenders. It is likely impossible to replicate, but the Americans can have confidence in knowing Miller has excelled on this stage before.